Last weekend had Grand Prix Toronto won by Esper Dragons (notably the only copy to day 2 according to the day 2 breakdown here). The SCG Standard Classic (which is notably much smaller than an Open) was taken down by a very odd Naya Midrange deck. What does this do to the future of Standard prices? Well there weren’t a lot of colors in the top decks. That’s for sure. 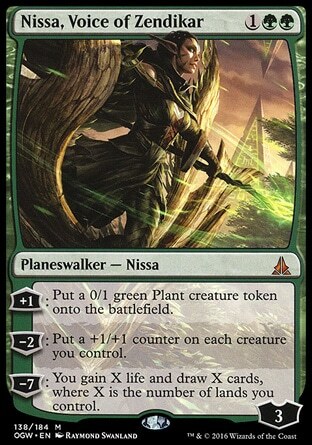 Nissa and Gideon combine for the one-two planeswalker punch that currently support the G/W tokens deck. 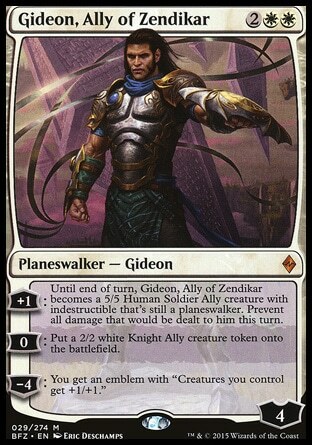 In Toronto, there were 10 G/W Tokens in the Top 32 and Gideon was played outside of that deck. The top 32 had 40 copies of Nissa and 60 copies of Gideon. That’s a lot for planeswalkers who prices have barely budged since the Pro Tour. This pair of walkers are from the same block so I think it would be wise to invest in them as they won’t rotate until next April. I think we will see them to continue to creep up by $0.30 per day until they pop. Nobody is noticing their slow ascension but once people do it will cause a price correction. Next on our list of enemies is Tarmo…. I mean Sylvan Advocate. This card was the highest played card on the weekend. It showed up in staggering numbers at Toronto (69 copies in 32 decks) and almost as equally impressive numbers in Milwaukee (29 copies in 16 decks). It has already had a dominant rise the weekend of the Pro Tour but it keeps showing up in numbers suggesting it might be one of the best cards in Standard. It’s rare but possible for rares to hold values as high as $10-12 and this might be one of them. Oath of the Gatewatch was a small set so there may not be a terribly large number of them in the wild. If you are thinking of getting these to play with, you don’t have much to gain by waiting. 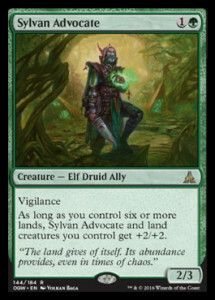 Advocate is showing up in multiple different types of deck lists and is a recipe for a fast rising rare. These three cards show up across multiple archtypes. Oath of Nissa is in G/W Tokens and G/R ramp decks. Declaration in Stone is played in White Humans, Bant Company, and G/W Tokens. Dromoka’s Command is having a last minute revival as the main form of removal for G/W Tokens and Bant Company. I’m not terribly interested in buying into Declaration which seems to be finally dropping in price as supply increases and Dromoka’s Command that rotates in September. 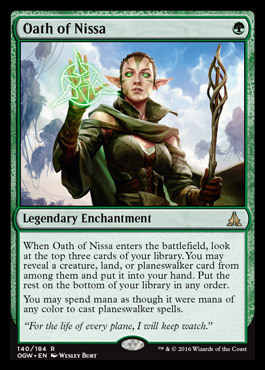 Oath of Nissa feels like the type of card that will continue to be good card filtering into the next block and worth a pick up at $2. Turns out there is an amount of extra text you can throw onto a Serra Angel to make it good. Archangel Avacyn rounds out the best performing cards of the weekend putting 73 copies into 48 decklists this weekend. There is apparently no stopping this train but the true value lies in the difficult of opening flip mythics. 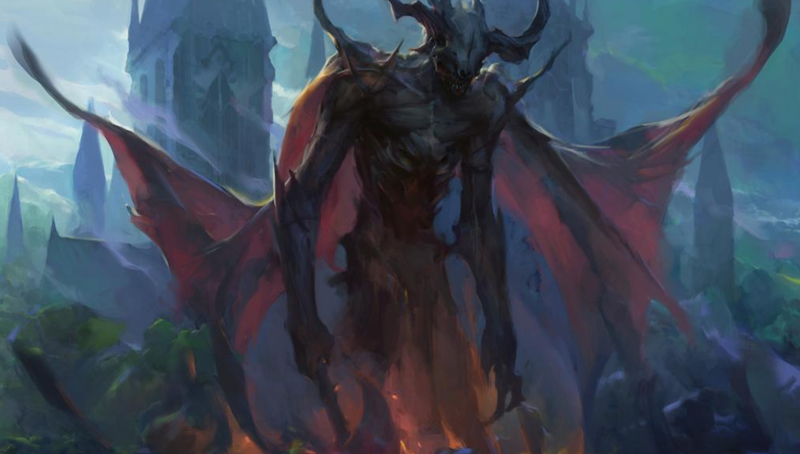 Without MTGO redemption kicking in yet, we are unlikely to see a reprieve in Avacyn’s price. It’s possible it might still not move that much given how much more the redemption supply will affect regular mythics instead of flip cards. If you’re not a Standard player you can probably find a much better time to pick this up. I’d estimate by the holidays of 2016 she will be a $10-15 card. 0 copies in the Top 8 of this open. 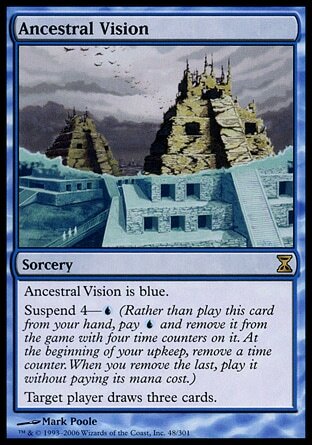 Some decks in the Top 32 played a few copies of Ancestral Vision but Thopter Foundry is no where to be found. I think it’s almost safe to say that the Thopter Foundry unbanning is doing less than the Wild Nacatl unban. If you’re holding copies of these hoping they will go up I think it’s time to sell. I wouldn’t expect them to do anything but drop from here. This card is dominating Standard and Modern and has seen a big resurgence from it’s all time low during the release of the event deck including it. If you’re a Modern player I would strongly recommending to wait for this to rotate before buying in. I’m not sure it will continue to hold it’s current price tag. 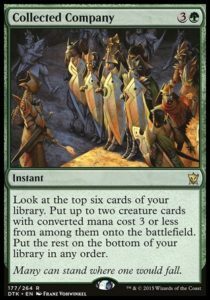 It’s one of the few cards in the Abzan Company deck you play more than 1 of but that doesn’t mean it will maintain it’s $25 price tag. If you want to play them in Standard and Modern I would rather buy foil copies. There are a lot less of them out there and they’re unlikely to see as large of a collapse when Company rotates. I’m going on a grinding binge. I’ll be at GP NYC this weekend and hope to pick up some sweet deals at the vendors. Green is really good in Standard. We need to stop underestimating it. White removal is still insane. I’m afraid I disagree on Avacyn being $10-15 by the holidays. Her casual appeal, plus her double faced rarity, as well as price memory will make $20 a more realistic price floor. 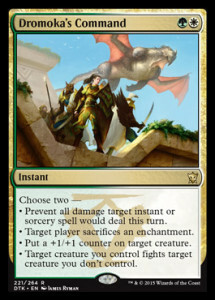 Can anyone comment on Archangel Avacyn’s Commander appeal or usefulness?? As a commander, she’s rather outclassed. She definitely has a place in the 99 though, since there are a couple flash happy decks around. She started pre-ordering at $15 and a lot of people thought that was a stretch. I don’t think she will command such a high price tag after 7 months. Personally I don’t see that low a tag coming either as long as she is in Standard. 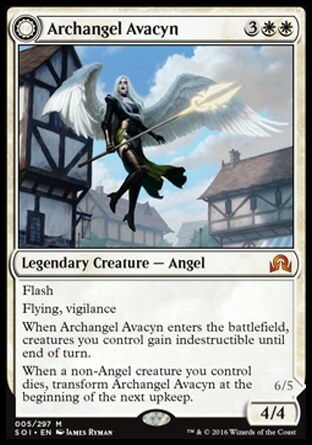 Avacyn hits a lot of the markers for high value: mythic, very powerful, strong casual creature type, and featured mechanic. Being in a popular set surely limits the ceiling, but magic card prices are like parachutes shot from a cannon: fast up, and SLOW down. As long as it sees play in top lists, the price isn’t going anywhere that low anytime soon. The preorder price is NOT a good measure, as stores can underestimate prices on a rare occasion. 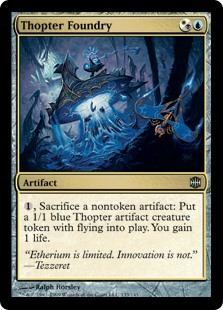 Look no further than Jace, VP for an example of this (although granted this phenomenon will be rather less for Avacyn). 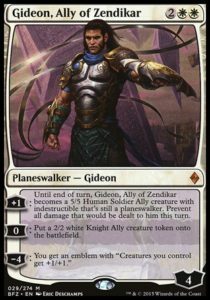 Avacyn was rather considered as a sleeper in the preorder weeks in my opinion. Granted, she won’t be $50, but she will still hold a quite a bit of demand due to the lower than average mythic supply. So, that leaves her in the $20, perhaps even $25, price level. Boros angel commander that already has to compete with a lot of other powerful legends, has a mediocre board clear and is less powerful as the game goes on while costing 5. Her indestructible ability is less relevant, and serra angel with limited upside isn’t turning anyone’s head in EDH.